An estimated one million people came out to protest in London on Saturday to show support for another Brexit referendum. The protests come after the European Union granted an extension for the Brexit deadline, which gives lawmakers this week to approve the Brexit deal and leave May 22. If the UK does not pass a deal, they have until April 12 to decide what to do next. Hundreds of thousands of protestors took to the streets of London on Saturday to demand a second Brexit referendum. The protest, called “Put It To The People,” was organized by the People’s Vote campaign, which is made up of more than 100 grassroots groups that support a second Brexit vote. Organizers for the protest estimated that a million people turned out, although there is no way to independently confirm the number. What is known for certain was that there was a wide variety of people who came out to show their support for a second vote. British citizens from all over the country came to London to join the protest, and British MPs from all across the political spectrum also attended. The protest was not limited to British citizens. People from other European Union (EU) countries flew in to join the protest, including from Italy and Ireland. The protest comes after EU leaders and Prime Minister Theresa May agreed on Thursday to extend the Brexit deadline. The original deadline for Britain to leave the EU was March 29, and now under the current extension the UK will leave on May 22 if Parliament passes May’s Brexit deal. That might seem like a simple extension, but there are a lot of different ways this can go. Now, the UK essentially has to decide between passing May’s Brexit deal or opening a whole other can of worms. Lawmakers essentially have this until the end of week to pass May’s plan, if they wish to leave the EU on May 22. However, May’s Brexit deal is extremely unpopular with both liberals and conservatives, and it has been voted down by Parliament two separate times. The first time was in January, when MP’s voted against the deal by a 230 vote margin – the biggest defeat in Parliament’s history. The second time was earlier this month, when the plan was again defeated by a margin of 149 votes. If May’s Brexit deal does not get passed, MPs will have until April 12 to decide what they are going to do instead. The UK has four different options if they choose not to pass May’s plan. The first option is to ask the EU for a longer extension. While this would give them more time to negotiate, including potentially negotiating a new deal, extending negotiations even more would require the UK to hold elections for the EU’s European Parliament in May. Electing new representatives for the UK to the EU’s Parliament would not make much sense if the UK is planning to then leave the EU. The second option is a no-deal Brexit, which basically means that Parliament would just accept the situation and move forward with Brexit. However, earlier this month, Parliament debated and voted to reject a no-deal Brexit. The third option is invoking Article 50, which would cancel Brexit. An online petition supporting this option went viral and got over 5 million, but Theresa May has ruled out invoking Article 50. The final option is to hold another referendum altogether, which is the driving force for the protests on Saturday. Again, Parliament rejected an amendment for a second referendum during a series of votes earlier this month. Parliament has strongly opposed these options, which makes it extremely difficult to see a path forward. The deadline for Brexit is coming fast, and UK lawmakers have still not come up with a plan that even a majority of Parliament can get behind. Parliament now has this week to decide if they are going to pass Theresa May’s Brexit plan. If the deal is voted down again, Parliament could hold a series of votes to see where MP’s agree and disagree. That move could reveal if support for a second referendum has shifted at all given the recent changes to the Brexit negotiations. While Parliament did vote against a second referendum in the past, there is support for it both among MP’s and the British populous. Back in February, the Labour Party announced that they officially supported a second referendum. Labour Party leaders are also considering a plan by two of the party’s members where MPs would vote for May’s deal on the condition that it is then put to a public vote. That move would essentially allow the UK to vote on Brexit again without an official referendum. While that might seem like a good potential option, it still relies on passing May’s unpopular Brexit deal. Recent polls in the UK suggest that if there were another referendum, Britain could vote to remain in the EU. 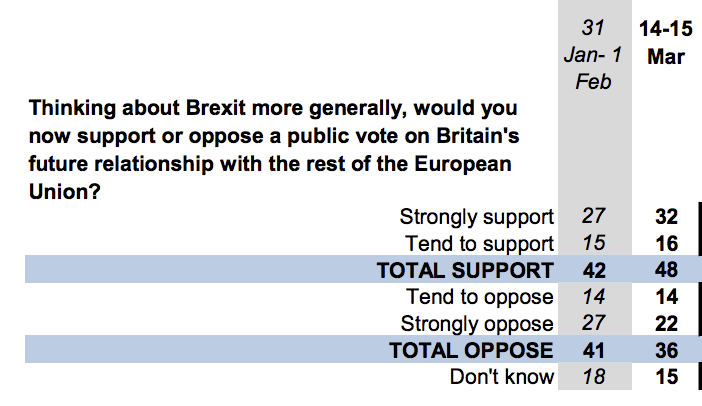 A snap poll last week found that nearly two-thirds of respondents support remaining in the EU over Brexiting with May’s current deal. If the options were remaining or leaving without a deal, remaining would still win. Almost half of the poll’s respondents said they would support another public vote.